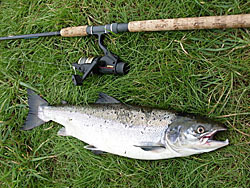 All legal fishing methods are allowed, including fly, lure fishing (spinning), worm and prawn (but not maggot, ground baiting of any sort, or the use of fish food pellets or boilies). In line with Environment Agency bye laws, the season runs from 1 April to 7 October, followed by 10 days (i.e. upto 17 October) when fishing may continue on a catch and release basis only. During this period the use of worms or prawn is illegal. By far the most successful method for sewin is fly fishing from dusk onwards. For salmon, the vast majority of anglers favour spinning or worming, although devotees do have success with the fly. The earliest salmon caught last year on our waters in 2011 was on the 2 April, in coloured water and on the fly!